I stopped playing World of Warcraft after Wrath of the Lich King. Finished all the quests. Had no interest in raiding. Decided to duck out since I love cold weather more than basically anything in life, and WotLK's frosty tundras seemed like the ideal high note to go out on. After ten years away (How is that possible???) I've come back for the launch of Battle for Azeroth. There's an overwhelmingly positive buzz surrounding the expansion, and it seems like a good excuse to see how much the game has changed in the last decade. 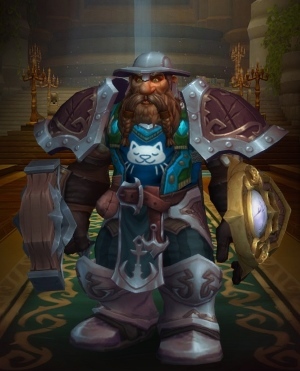 Why am I a dwarf Paladin? I exclusively played Horde back in the day, which makes an Alliance character suitably jarring for my return. Paladin is a no-brainer class choice. I mean, you throw a shield that bounces between multiple enemies like a pinball. Then, when everyone you just ticked off surrounds you, you get to bonk their heads with whirling magical hammers as if you're a Diablo 2 Paladin. You know, that game from twenty (How???) years ago. Battle for Azeroth includes a level 110 character boost to jump directly into the expansion. For a lapsed player, those first few minutes in the deep end are something else. There's an impressive cutscene that could only be more impressive if you had any context whatsoever. Then your character is deposited to the world (of warcraft) as every centimeter of the UI goes into red alert mode. You have unspent talent points! You have new items in your inventory! You have new quests available in the Adventure Guide! You have contracted malaria! Wait, that's Far Cry 2. Once you familiarize yourself with the menus and fiddle with your settings you should take a moment to soak in your surroundings. It's easy to forget, but World of Warcraft features some of the most evocative and moody world design you'll ever see. The use of color, space, density (from tightly packed clusters of attractions to sprawling stretches of quiet space laid out with the same attention to detail), and flow in Battle for Azeroth's zones are even better than they were the last time I played. This aspect of the game alone makes BfA worth playing if you're a fan of occasionally looking beyond the quest marker and your enemies' feet. I've been spending my time in the Alliance islands of Kul Tiras. 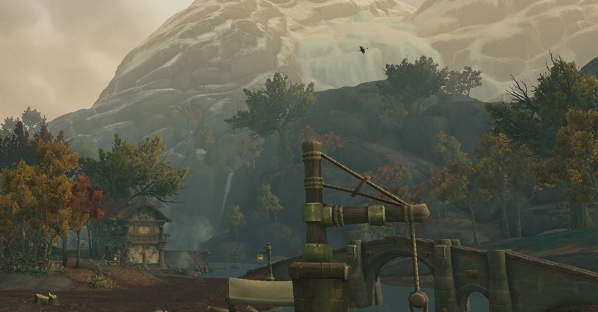 Tiragarde Sound combines frosty mountains with subdued coastal towns, and is basically designed to make you stop every five minutes to pan the camera around and gape. Then there's Drustvar, which is Do You Like The Witcher? : The Zone. The island is jam-packed with ghosts, spooky basements, cults, monsters, curses, and creepy children. One of these two islands is my favorite MMO areas of all time. I'm just not sure which one it is, and which one is the runner-up. Blizzard's quest design has come a long way in ten years. While you are mostly carving a bloody breadcrumb trail of corpses (breadcorpses? bodycrumbs?) and collecting/delivering items, there's a tangible sense of momentum and variety. Quests are tightly clustered in unique-looking areas, so you're stumbling a across an entirely new scene with its own vibe every ten minutes or so. Many quests put you in control of vehicles, or throw you across the map, or drop you into an instance in which the state of the world changes in significant ways. There are even some exceptional in-game cinematics that plop your idiot alongside important characters as the story hits its major beats. I find myself getting sidetracked every few minutes by some new concept. There are hidden treasure chests - some unlocked by solving an environmental puzzle, and some tucked away on hard-to reach perches. Named elite enemies hang out in cute little bad guy tableaus waiting to drop unique loot. Some special pieces of armor level up as you adventure, unlocking new tiers of bonuses to choose from. As a result of all this, you're constantly doing something different, paying attention to some new aspect of the game. The entire experience conveys a sense of immediacy and freshness that I did not expect from a game that launched fourteen years ago. Did I mention it's got frosty tundras? Now that Brunto the Paladin has blundered through Battle for Azeroth I'm eager to make a fresh character. What's it like to start at level 1 and work my way through the decade of content I missed, then the Horde side of the BfA story? What's up with pet battles? Level scaling? Transmuting? The new classes like Monk and Demon Hunter? Archaeology? Garrisons and class halls? I look forward to finding the answers to all these open-ended questions, and to spending an entire week agonizing over the perfect race/class combination.